Renting a copier is the easy and efficient way to meet your company’s temporary needs, including company marketing projects, year-end financial reports, tax season reports, trade shows, cooperate events, temporary and other special projects. Powers Business Machines carries a comprehensive line of Sharp copiers and we provide daily, weekly and monthly rentals. When you rent a copier from Powers, our knowledgeable and friendly technicians will deliver your equipment, and even help with installation and answer any questions you may have about your new equipment. All our rentals come with our high value service and commitment to customer satisfaction. Whether you have a copy-intensive project or any other short-term need, we have the equipment to help you achieve your goals. 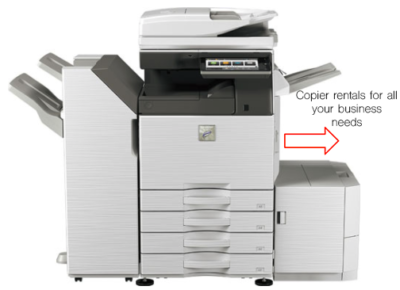 If you’re ready to rent a copier, please call 757-595-2646 or fill out our online form.